H.E. Mr. Habib El Malki, Speaker of the august House of Representatives of the Kingdom of Morocco addressed, in his interview with the “PUIC” several crucial issues of concern to the Islamic World and Islamic Joint Parliamentary Action, including current challenges; Palestinian cause; role of Parliamentary diplomacy; expanding economic and financial interactions among Muslim states; combating terrorism and extremism; and anti-Muslim rhetoric in the West. Mr. Habib El Malki: Parliamentary activities among Muslin countries have known tangible mobility and dynamism and action since the establishment of the PUIC. Conferences and meetings have been organized in which a number of issues of common concern were discussed, especially those related basically to the security of Muslim countries as well as issues of Muslim communities in non-Islamic countries, and the Palestinian Cause, considered as a central cause to the Muslim States. Parliamentary meetings among those states addressed focal issues, including foreign intervention in the internal affairs of Muslim States, in addition to extremism and terrorism. Meetings of the Parliaments of Muslim States focused on recalling the necessity of respecting human rights; enhancing the role of women and youth; condemning violations of these rights which take place in all regions of the globe, including the rights of Muslim minorities; affirming the importance of dialogue of civilizations, and confronting Western campaigns which run Counter to Islamic Values. On the other hand, these meetings have discussed ways of developing trade relations among Muslim states, and reminding of available opportunities and potentials which enhance competitiveness of these states on the international arena. Islamic parliamentary activities also paid attention to the discussion of the challenges of sustainable development with its economic social and environmental dimensions, as well as, ways to counteract them in order to ensure the rights of coming generations, and the necessity of following up the process of development, modernization, and reform in the Islamic World, in addition to reviewing new crises that affect a number of sisterly Muslim countries. Joint Statements and recommendations were issued that express the vision of Muslim Parliaments thereon. In general, joint Islamic parliamentary action was able to achieve the minimum level of contact and dialogue among Muslim Legislative Councils, and the PUIC has constituted the possible and necessary institutional space for encompassing such dialogue. PUIC: How is it possible to activate Parliaments of Islamic States aimed at advancing joint Islamic action in various fields? Mr. Habib El Malki: To achieve this objective, parliamentary prudence ought to be consolidated, which is considered a constitutional and moral necessity for the sake of promoting the functions of parliamentary action. In this respect, we ought to recall the necessary values and principles of Parliamentary prudence in terms of equality, fairness, quality, transparency, linking responsibility to accountability, equity, evaluation, creativity, productivity, seeking to serve public interest, qualifying the institutional structure of Parliaments, enabling human resources to have access to appropriate work mechanisms, and the constant feeling that parliaments are the heart-beat of the street and the expression of its concerns and aspirations. There must be keenness on continuing to create and develop knowledge, as well as continuous training within a vision that considers parliamentary prudence as the prudence of the state and society and the system of public rights. Of course, all that is pursuant to practical programs that include aspects of legislation, control and diplomacy, good evaluation of public policies, as well as organized and transparent structure, and qualified human resources. We must work to develop exchanging experiences and the best practices in the field of parliamentary management, and also keenness on the independence of the legislative powers that render them effective forces through Parliamentary diplomacy, in several international issues such as climate, migration, combating terrorism and extremism, and all forms of defending the causes of Muslim peoples. Mr. Habib El Malki: Firstly, we must recall in this respect the great efforts exerted by His Majesty King Mohammad Vl, Chairman of Al Quds Committee for supporting the Palestinian cause and preserving Islamic and Christian sanctities in Al Quds, and offering material and political support to the brotherly Palestinians until their independent State is established with Al Quds as its capital. We must not also ignore the big role assumed by the Agency of Beit Mal Al Quds in supporting the efforts of the Palestinian people in Al Quds; and preservation of the Arab and Islamic character of the City, its status and sanctities, as well as, maintaining Palestinian properties and heritage, and offering social services to the Palestinians in the fields of health, education and culture. The stance of the Kingdom of Morocco was, and continues to be, well- established vis-à-vis the Palestinian cause which exists in the hearts of Arabs and Muslims, and is included in the Parameters and priorities of the Moroccan nation. 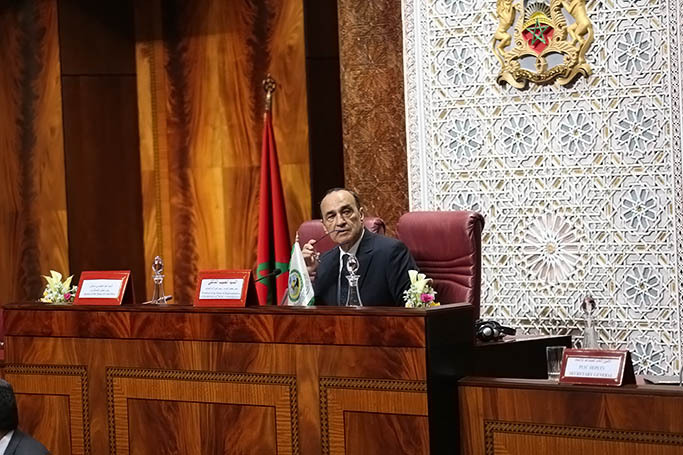 The Kingdom of Morocco is keen on continuing efforts to defend the right of the Palestinian people to national independence, liberating their land and establishing their independent state with Al Quds as its Capital. As customarily, the Kingdom of Morocco does not accept, but strongly condemns the savage crimes against the unarmed Palestinian people which are considered a blatant violation of the International law and the international humanitarian law, and the necessity of serious action to stop these crimes, and provide international protection for the Palestinian people, and hold the USA fully responsible for the implications and disastrous consequences of its decision, which is rejected by the international community, on transferring its embassy to occupied Al-Quds. In the most recent development, the House of Representatives has considered the decision of relocating the US Embassy to the City of Al Quds, nil and void, and contrary to international law and the UN Charter, and it cannot alter the established historical truth that the city of Al Quds is an occupied city, and that it is the immortal capital of State of Palestine. Mr. Habib El Malki: Parliamentary Diplomacy is a distinctive and methodical mechanism and style in the field of international relations. It practices its activities through international, regional, and multilateral relations between national and regional parliamentary organizations and institutions; that such institutions and organizations are democratic representatives of peoples and one of the manifestations of practicing constitutional competencies by the legislative institution. Activities of Parliamentary diplomacy encompass all political, security, social and environmental fields of life, considered as subjects for discussion by its meetings and symposia in order to keep abreast of the fast transformation known to the life of peoples aimed at preserving social cohesion and conformity as well as creating a balance between countries of the world. In this regard, parliamentary diplomacy seeks to assume an essential role in the formation of a new world order which is more equitable and beneficial, especially to the interest of the peoples of developing countries. It must act in the name and interest of peoples, aimed at materializing common humanitarian and world values, primarily, democratization of international relations, and rendering the international order more humanitarian, just and equal. Parliamentary diplomacy is keen on negotiation in order to harmonize between the different interests of states through finding acceptable and compromise solutions that are favored by the majority of the states, and which enable parliamentary organizations, institutions and bodies to take decisions that serve the interest of peoples. Mr. Habib El Malki: of Course, expanding economic and financial interactions, and consolidating relations among Muslim countries lead to strengthening coordination and solidarity among countries of the Islamic World, through permanent institutional channels, whether at the bilateral or multilateral levels. We must continue to build partnerships that generate mutual benefit and launch projects of economic and financial development, through accelerating the setting up of cooperation strategies based on values of solidarity, justice and common interest. It is worth referring to the necessity of enhancing joint actions among governments, parliaments and the private sector, in the framework of a system of harmonious and coordinated efforts, and promising cooperation at the level of the Islamic World, which are closely connected with the objectives of sustainable development and combating Climate Change, as well as enacting appropriate legislations which enhance economic and commercial cooperation, and finding solutions and answers to the economic and social issues and challenges which face the Islamic World. Mr. Habib El Malki: In order to combat the phenomenon of terrorism and extremism we must adopt a unified vision based on several points which we summarize in: confirming non-linkage between Islamic religion and the phenomenon of terrorism and extremism; enhancing mechanisms of international Islamic cooperation in the field of combating extreme terrorist groups in order to preserve national security; drying up sources of terrorism; and informing about tolerant Islamic principles and values, including the values of moderation and tolerance. At the same level, channels of communication and coordination with the various initiatives and national regional and international efforts exerted in this respect must be enhanced and coordination established, in order to eliminate this phenomenon and its causes. We must deepen the spirit of tolerance, brotherhood, rejecting all calls for bias, discrimination, and refusing to screen or broadcast any material that may constitute incitement for extremism and violence. Mr. Habib El Malki: There are several ways and means necessary to counter anti- Islam and Muslim rhetoric which may be summarized in the following: Consolidating the principle of tolerance, which means respecting, accepting and appreciating the rich diversity of the cultures of our world, and the different forms of expression and human characteristics. This tolerance may be further enhanced by knowledge, openness, communication, freedom of thought, conscience and belief. This is not only an ethical obligation, but also a political and legal duty that contributes to the replacement of the culture of war by the culture of peace. Tolerance is necessary among individuals and groups. Efforts to enhance tolerance and to form stances based on openness, and listening to each other as well as solidarity, must be exerted in schools and universities, and through non- regular education, at homes, and in places of work. The mass media may also play a constructive role in facilitating dialogue and discussion in a free and open manner, and in propagating the values of tolerance, especially through raising the awareness of peoples of their common rights and freedoms. Focusing on awareness and education, considered essential pillars to materialize tolerance, may be viewed as an urgent necessity. Therefore, we must encourage the adoption of systematic and intellectual means to address the causes of intolerance in the course of a cultural, social, economic, political and religious campaign i.e. the major roots for violence and exclusion. Then policies and educational programs may contribute to enhancing understanding, solidarity, and tolerance among ethnic, social, cultural, religious and linguistic groups, and between nations, also.